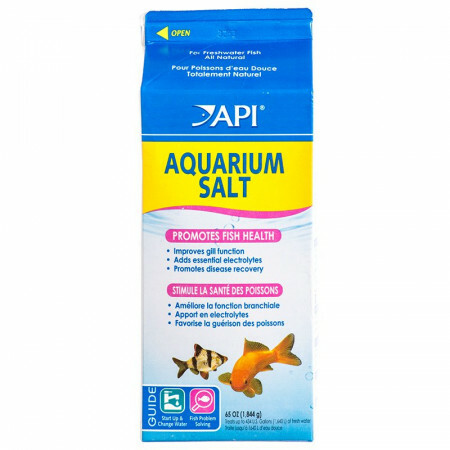 Aquarium Pharmaceuticals Aquarium Salt is an all natural salt, made from evaporated sea water, promotes healthy gill function, reduces stress and loss of electrolytes. Used to improve the efficiency of medications and reduce the harmful effects of nitrite. As a General Tonic and Stress Reducer: Add 1 rounded tablespoonful for every 5 U.S. Gallons (19 L), or 1/2 rounded teaspoonful for every U.S. Gallon (3.8 L) of aquarium water. To Enhance Tropical Fish Disease Treatment: Add 1 rounded tablespoonful for every 5 U.S.Gallons (19 L) of aquarium water. Note: Aquarium Salt does not evaporate, and is not filtered out so aquarium salt should only be added as directed with each water change. Treats up to 107 U.S. Gallons (404L) of fresh water. I always put a little bit of this in my tank for my mollies, they seem very happy. I haven't had any fish get sick yet but if they did, I would definitely use this. Great for my quarantine tank! 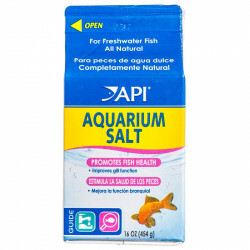 I have used API's aquarium salt for years and it has never let me down. I only use in my quarantine tank since my main tank is planted and salt will kill my plants. I use salt for its healing properties and also to naturally treat external parasites such as ich (with increased water temp). Make sure you have proper tank aeration when using since it can lower the oxygen levels in your water. This is a great product for freshwater tank onwers!!! This is the 1st item I use when appear ill.
Salt for a healthy tank. I have Rainbows and a Molly. They like a little salt in their water so I use a teaspoon per gallon of new water when I'm cleaning and re-filling the tank. Check to see if your fish prefer salt though before adding it on a regular basis to your aquarium. This stuff can also be used for all types of fish as a treatment when they are sick. Works perfect for water changes and treating fish diseases. This heater was a really great price, the best I have EVER seen. It works perfectly! I am highly impressed. I breed fish and use this product all the time! It's great for repairing tattered fins or open sores and for distressing new fish. I highly recommend it! Highly recommended for proper tank maintenance, don't even think of owning a tank without it. 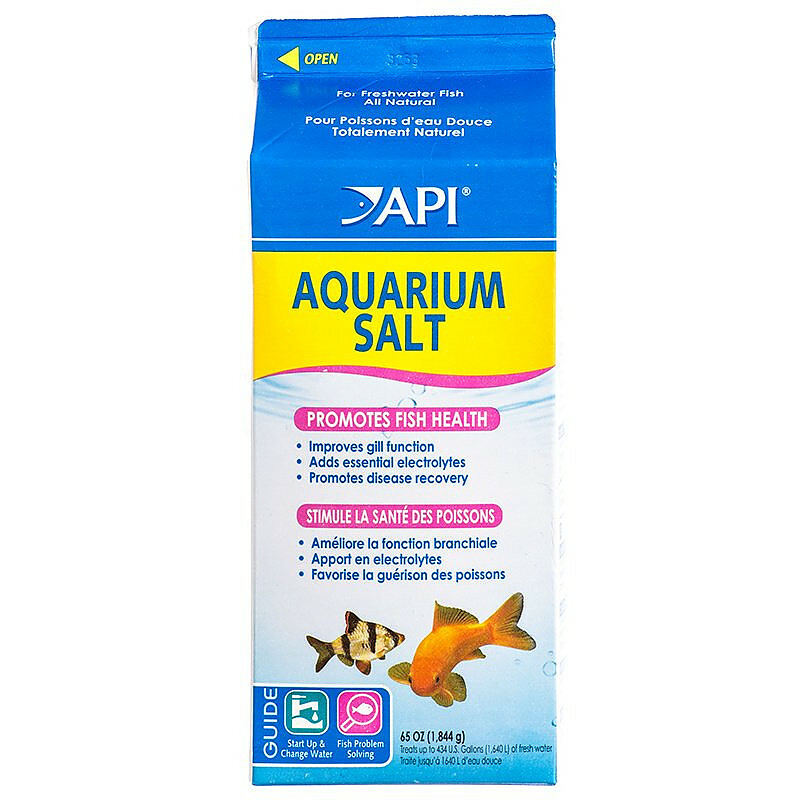 The API aquarium salt really helped me through a tough period with tank nitrites when I was cycling. One warning about salt - it can actually "recharge" some freshwater ammonia absorbing crystals/products. I made this mistake starting out. It caused the ammonia crystals to purge ALL of the held ammonia into the tank. I have used it for years, great for water changes, all my fish have loved it!